This beautiful little parrot named Tweety isn't on the lookout for 'puddy-tats,' he's looking for bedtime snuggles! 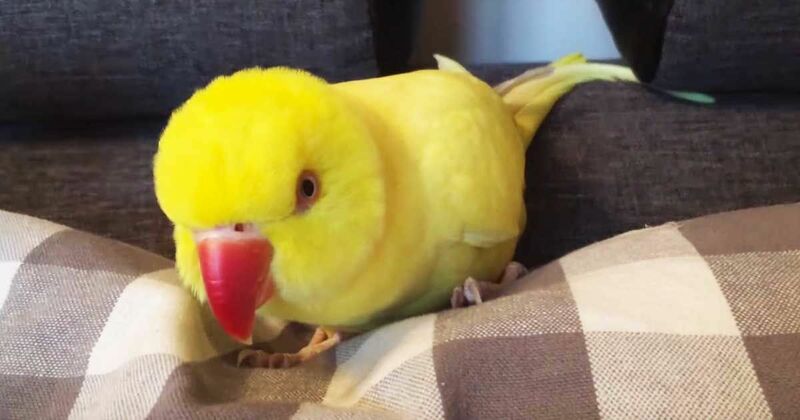 In this viral YouTube video that's been viewed over 100 thousand times, the bright yellow bird swoons us with his adorable little coos in request of more pets. People don't often think of birds as the snuggling type, but these animals are highly intelligent and adore interacting with their owners. Well, Tweety shows us just how much he loves being rubbed and getting his feathers fluffed before bed. Every time his owner stops, he lets out some clicking noises, coos, and even whistles! It's amazing hearing all the different types of noises this bird makes in hopes of getting more attention - and it's also heartwarming to watch the little guy close his eyes and bury himself into the pillow each time he gets some pets. We'll happily give you bedtime snuggles, Tweety! But, don't just take our word for it. Check out the sweet video right here below. Tweety is just the cutest! Don't forget to share this cute video with your friends on Facebook, Twitter and Pinterest.